When it comes to his unanimous decision win over Cortez Coleman in June at LFA 15, middleweight prospect Chris Harris admittedly didn’t have the kind of performance he’s capable of, but is nonetheless pleased he was able to come away with the victory. “I didn’t get a finish, but you can’t finish everybody, and Cortez is very tough,” Harris told MMAWeekly.com. “I didn’t necessarily get the fight like I normally do because I had a back injury going into a little bit, so I didn’t perform the way that I would normally would. Though he was coming off a loss in his first bout of 2017 to Jordan Young at Bellator 171, Harris didn’t overwhelm himself with pressure to not lose two in a row. “I really didn’t think about that at all,” said Harris. “I don’t really put a lot of pressure on winning or losing. Obviously losing two fights in a row is a big deal as far as making it to the UFC or whatever the case may be, but those aren’t really do or die goals for me. 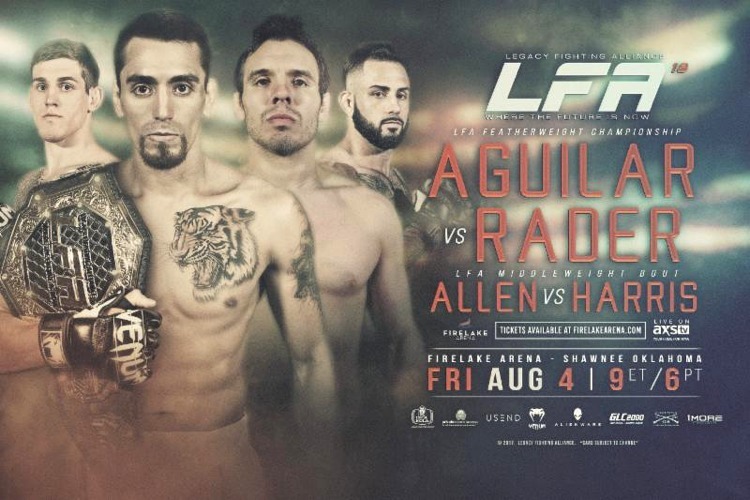 In his next bout, Harris (9-1) will look to keep his winning ways going when he takes on Brendan Allen (7-2) in a 185-pound co-main event of LFA 18 in Shawnee, Okla.
“I feel like he’s pretty well-rounded,” Harris said of Allen. “I don’t think he’s the best I’ve fought. I don’t think he’s the best grappler I’ve fought. But I think he’s got the best mix of everything. Not one to put undue pressure on himself, Harris is just looking forward to August 4, and whatever comes after that will come.